State Senator Martin Sandoval (D-Chicago) was the special guest speaker at the Federation of Women Contractors (FWC) member luncheon at the East Bank Club. Senator Sandoval’s effort to stimulate the economy was recognized with the Diversity Super Star Award. “Senator Sandoval is a driving force for providing opportunities for all small businesses in Illinois,” said Beth Doria, Executive Director of FWC. The Federation of Women Contractors is the oldest and most recognized leader among women-owned construction businesses in the Chicago land area. In existence since 1989, it is committed to the advancement of entrepreneurial women in the construction industry. FWC members include general contractors, subcontractors, suppliers and service-related firms. Senate Bill 56 extends the expiration date of a law that was enacted in 2009 to offer relief to homeowners struggling with their mortgages. It requires that lenders give homeowners 30 days notice to seek housing counseling before filing a default on a home loan. Should a homeowner decide to seek counseling, the lender is required to grant an additional 30 days to work out a settlement before a foreclosure action may be filed with the courts. Although the economy is on the upswing, homeowners statewide are still feeling the effects of the decline. Cook County has the 12th highest foreclosure rate in the state. Continuing to offer these protections and services to keep people in their homes is imperative to continuing our economic recovery. Another measure, Senate Bill 1602, provides protection to tenants that live in a building that is in foreclosure. The legislation proposes that tenants would be entitled to stay in their apartment through the end of their lease, independent of a foreclosure filing. If a new owner buys the property, the new owner must provide 90-days notice if they do not plan to renew the lease. The new owner can make an offer to the tenant to terminate the lease early, but only if certain qualifications are met. Senate Bill 1740 creates a property tax incentive to those who purchase and rehabilitate abandoned properties. “We are seeking to regulate this industry before Illinois experiences any of the problems that other states have had,” said Sandoval, a member of the Senate Licensed Activities Committee. Fracking is an increasingly controversial process for extracting natural gas that involves injecting water and chemicals into the ground to force out the gas. In other states, the process has been tied to contamination of drinking water and other environmental concerns. At the same time, the natural gas extraction industry is primed to create jobs and assist in boosting the nation’s energy independence. Senate Bill 3280 requires oversight and regulation of fracking by the Department of Natural Resources. Specifically, fracking operators would be required to provide the department with a complete list of the chemicals used in the hydraulic fracturing process before beginning work. The proposal requires that fracking wastewater pits be lined to prevent leakage into groundwater. 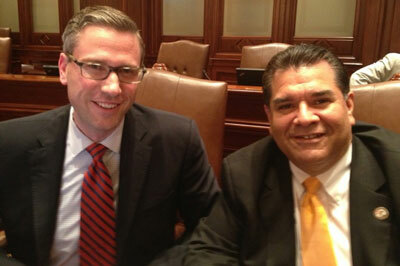 Illinois State Senator Martin Sandoval (D-Chicago) joined with his colleagues in passing a balanced budget for the state. The measure, approved by both the Senate and the House of Representatives is now on the governor’s desk waiting for his signature. The state budget that was sent to the governor focuses on preserving funding for education and pays down old bills. 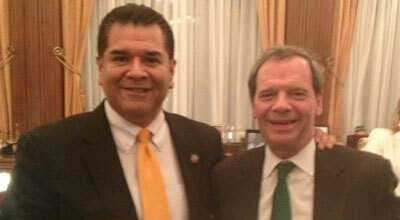 “I have, and will continue to work to ensure the financial situation in Illinois is turned around. 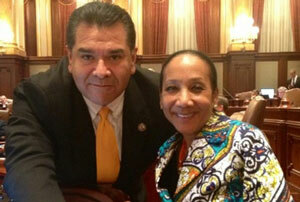 We have focused on funding priority programs that are necessary to the people of Illinois,” said Sandoval. The budget also ends the practice of the state underfunding key budget lines and stringing out social service providers at the end of the budget year. To ensure college students were also not left holding the bag, the fiscal year 2014 budget includes an additional $2 million for the MAP program.